The Eagle and the Dragon have become emblematic of the Roman and Chinese Empires. They had contemporary significances. The eagle standard was adopted by the Roman legions since the 104 BCE reform of Marius. It was made of gold, and, as a cult symbol, regularly worshiped by the army during the year. A legion’s standard never left camp unless the whole legion was on the move. Carried by a standard bearer at the forefront of every battle, the eagle was widely recognized as the symbol of Roman might and dominance. The dragon is the first of four intelligent mythical creatures in Chinese tradition, often symbolic of the four cardinal directions. The blue dragon stands for the East, the white tiger the West, the red bird the South, and the black tortoise the North. Being a powerful and versatile creature that can dive in the sea, fly in the sky, and intermediate between worlds, the dragon features in many Chinese myths. 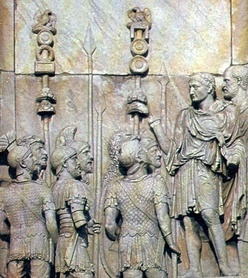 Augustus’ breastplate doubled as a propaganda billboard. Its center shows Parthia returning the eagle standard captured from Crassus at the battle of Carrhae, a symbol of Roman honor redeemed. (Detail of marble statue, Vatican Museum, Rome). The eagle is the bird of Jupiter. 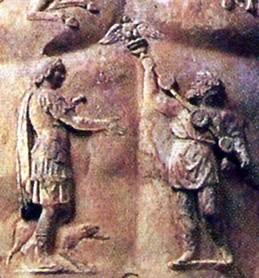 As the Romans deified their emperors, the eagle, together with Jupiter’s staff, became symbolic of imperial divinity. Confucians associate the dragon with virtue and strength, particularly that of the sage or the ruler. 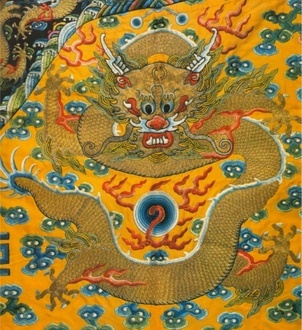 From the sixth century Tang Dynasty onward, the dragon becomes an imperial symbol. 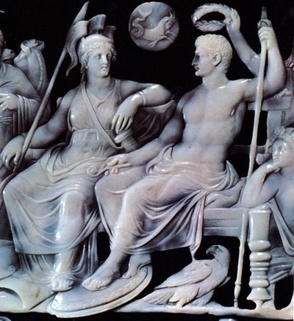 The Gemma Augusta shows Augustus in the guise of Jupiter sharing the throne with Goddess Roma while being crowned by Oikoumene. At his feet is the divine eagle. 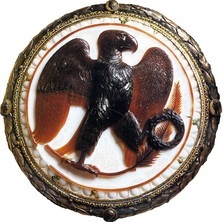 (Detail, onyx cameo,Kunsthistorriches Museim, Vienna, Austria). The center embrodery of an eighteenth century silk robe of the emperor. Its five claws identify it to be an imperial dragon. (Shenyang Palace Museum, Liaoning). Because of their significances, the eagle and the dragon often find their way into artwork and jewelry. First century onyx cameo (Kunsthistorische Museum, Vienna). 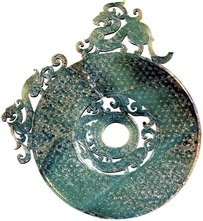 Jade pendent, third or fourth century BCE (Nelson Gallery-Atkins Museum, Kansas City).